The LX Club season for 2007 came to a conclusion with a very enjoyable fixture and meal with the Havant Club Veterans from Hampshire. On a cold but lovely sunny day the teams met at the Havant College pitch, and early omens for the Club seemed good, despite playing into a very low but brilliant sun, when Austyn Leaverland on the right wing poached an early goal by the Havant left goal post. The first half was virtually one way; a fierce shot from midfielder Sudesh Nayar rattled off the Havant post, and forwards Gordon Small and Tom Darlington tested Havant’s goalkeeper, Bernie Haverson, who had a fantastic game, to the limit. However, the LX Club pressure eventually reaped a reward, and with skilful play by Bob Grenside, following a penalty corner, Adrian Money precisely slotted home another goal for the LX Club to give a 2-0 lead at half-time. Following half-time and a winter sunset, the LX Club virtually occupied the Havant half for the second half. Brian Tubb came on as a rolling substitute for the totally reliable John Widgery at left back, and Brian combined with Alan Jackson up the right side, to create numerous opportunities for LX Club, but the Havant keeper was not to be beaten. Some ten minutes from the final whistle, Havant won a penalty corner, and after several interchanges of passes around the circle, Alec Haygate scored a goal at the left post for Havant. The game still seemed to be totally in the LX Club’s possession, but an opportunist goal by Havant’s Stuart Rowe from the top of the circle, flew past the unsighted Alan Dures, who had hardly anything to do during the game, especially with John Longden at his very best, subduing most of the opposition’s attacks. The final result of 2-2 was possibly against the run of play and possession, but Havant Vets deserved much credit for their perseverance after being 2-0 down at half-time. After a period under floodlights, both teams adjourned to the Havant Club House, where as usual everybody enjoyed the excellent main course prepared by Mary Davey with her beef and ale pie, followed by Anthea Ross’s tasty mincemeat dessert. 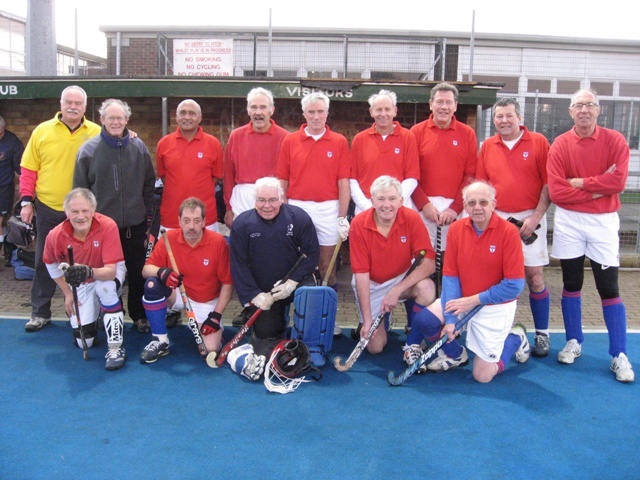 Many thanks go to the Havant HC Vets for their superb hospitality; to Colin Herbert (Havant) and Ken Veness (Chichester) for keeping their concentration and umpiring so well in the cold, and to John Davey (Organiser Havant) and Peter Ross (Match Manager LX Club), the latter unfortunately was unable to play because of injury. LX team: Alan Dures, John Widgery, Brian Tubb, David Read, John Longden (Capt), Alan Jackson, Sudesh Nayar, Bob Grenside, Austyn Leaverland, Gordon Small, Adrian Money, Tom Darlington.